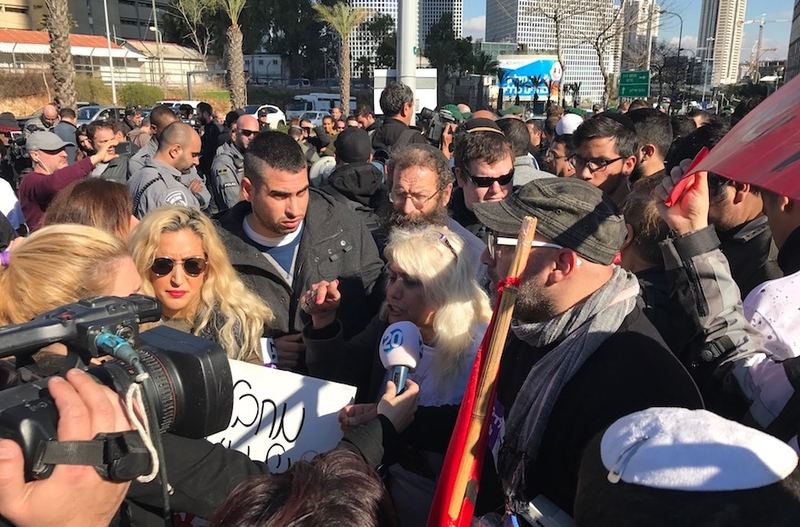 TEL AVIV (JTA) – As a military court prepared to render judgment on an Israeli soldier who last year killed a subdued Palestinian attacker in the West Bank, hundreds rallied outside army headquarters here on his behalf. Activists from far-right political movements carried flags and banners and shouted through bullhorns during the Wednesday morning rally. There were racist chants, and even threats against Israeli leaders. Some clashed with the several hundred police officers deployed to control the crowd. But in their support for Elor Azaria, many of the protesters expressed views not far from the mainstream. Even residents of famously liberal Tel Aviv who happened to be passing by on the sunny afternoon voiced support for the rally. Palestinian terrorist attacks and failed peace talks have contributed in recent decades to a rightward shift in Israeli politics. Compulsory military service means most Jews identify with soldiers. And polls have shown widespread public support for Azaria and, beyond that, the act for which he was convicted. In the hours after the manslaughter conviction was announced, leading politicians on the right and left called for Azaria to be pardoned. Prime Minister Benjamin Netanyahu was among them. Azaria, a medic in the elite Kfir Brigade, arrived on the scene following stabbing attacks by two Palestinians last March on soldiers in Hebron in the West Bank, a flashpoint for Palestinian violence against Jewish Israelis. One assailant was killed and another, Abdel Fattah al-Sharif, was injured. Minutes later, while Sharif was lying on the ground, Azaria shot him in the head in a scene that was captured on video by a local resident and shared with the Israeli human rights group B’Tselem. Azaria was arrested the same day and indicted nearly a month later. Autopsy reports showed that the shots by Azaria killed Sharif. Prior to shooting Sharif, Azaria had cared for a stabbed soldier. During the rally, news emerged that Azaria had been convicted, causing some protesters to break into tears. For security reasons, the three-judge military panel issued its ruling from inside the walled military headquarters rather than in the courtroom where the trial was held. The judges rejected Azaria’s “twisting” defense that he had acted out of fear and ruled he had been motivated by a desire for revenge. Azaria’s lawyers vowed to appeal. Yohanan Plesner, the head of the Israel Democracy Institute think tank, said the conviction showed Israeli institutions were strong. But he said the public reaction to the trial was worrisome. In the wake of the conviction Netanyahu, who first condemned Azaria’s actions and later phoned to reassure his family, joined politicians from across the political spectrum in calling for him to be pardoned. Much of the army’s top brass, and former Defense Minister Moshe Yaalon, had denounced Azaria’s actions as a violation of military code. Members of Yachimovich’s party and left-wing Jewish and Arab lawmakers from the opposition backed the ruling and opposed a pardon. But the broad support for Azaria by politicians tracks with public opinion surveys. An October 2015 poll by the Israel Democracy Institute, conducted well before the Azaria shooting in March, found that more than half of Israeli Jews endorsed shooting to death Palestinian terrorists who no longer posed a threat. In August, another poll by the institute found that about two-thirds of Jews justified Azaria’s act, and nearly half favored executing a subdued Palestinian terrorist over entrusting him to authorities. Fewer preferred the reverse, and 69 percent of young people backed such executions. Among Azaria’s supporters, a point of contention was whether it mattered if he was guilty. That division was clear among the protesters as well. “Azaria faced the dilemma: Should I obey my officers or should I lower the risk to my friends? Our soldiers should be told to shoot to kill, and then to verify the kill,” said Eitan Luz, a religious 30-year-old from the West Bank settlement of Maale Shomron who is working on a doctorate in electrical engineering at Tel Aviv University. As Luz was speaking, others interrupted to disagree. Ariel Rofeh, a 30-year-old from the settlement of Alfei Menashe, said during his army service he had killed Palestinians who had yet to attack him, which he characterized as commonplace, as rights groups have alleged. Soldiers should not be punished for violating an unjust law, he said, accusing left-wingers in leadership and the media of conspiring against Azaria. Ailin Ainesar, a religiously traditional 20-year-old soldier who stopped by the rally with her mother, said Azaria’s conviction felt like a personal betrayal, and she predicted it would hurt morale in the army. “He did the right thing,” she added of Azaria. Her mother agreed. Plesner said it was natural that Israeli Jews, for whom military service is part of their national identity, sympathized with Azaria. That did not mean they were abandoning the moral high ground they had historically held against all odds, he said, but now was the time for the state to reassert its values. Steps away from the rally, at the chic outdoor Sarona Market, Tel Avivians chatted at cafes and restaurants. People strolled and biked along the white stone pathways past children playing on a jungle gym. Eran Sosman, a 31-year-old tax lawyer at a nearby firm, was among several passers-by who said they sympathized with the protesters. The shooting had been blown out of proportion, Sosman said, and Azaria had been made an example for political reasons. Nikita Zazulinky, 32, was taking a lunch break with several of his coworkers at a high-tech company. He called the trial a “circus” and said nothing would have been done if the shooting had not been caught on video — he said that would have been better. His fellow lunchers agreed. But Erez Lotan, a 58-year-old producer in Tel Aviv, said the country’s support for Azaria was evidence of destructive social trends. “The morality of a nation, of an army, should be maintained. We’ve been occupying for 50 years already. I think it affects a lot of what happens in Israel,” he said.